A clever, inventive Monkey easily finds a common language with a stubborn Aries. It is her influence that explains the cheerful mood of a usually serious, even slightly aggressive Aries. In turn, he endows the erratic Monkey with perseverance and unbending will. People of this combination are so eloquent, charming and charming, that everyone likes without exception. They are able to attract attention to themselves: they talk constantly, they like to joke and laugh. On a combined horoscope Aries-Monkey — an extraordinary personality, full of excitement and energy. With enthusiasm explores the world around: active, inquisitive, mobile. It has a strong will and a strong character, but it is not too constant in its preferences. Relentless Aries-Monkeys do not tolerate loneliness: they quickly become tired and start to get bored. These deep, thinking people are able to entertain themselves, but they are too hungry for communication. The slow-moving Monkey loves noisy companies, loves to perform in public. In addition, the witty Aries knows how to defuse the most tense situation. People of this combination are universal favorites, tireless seekers of adventure. Sometimes Aries-Monkeys are too zealous in their desire to stand out from the background of others. They are active and active beyond measure: they want everything from life at once. Such an eccentricity prevents them from succeeding. Do not be too persistent in achieving their goals: the slightest obstacle is an occasion to turn off the intended path. The proud Monkey-Aries has a very high opinion of herself: she is intelligent, beautiful and very charming. This ambitious person will never agree to perform the role of the second plan. Differs sharp mind, dexterity, cunning. Find a way to loudly declare yourself, and will not feel a single bit of embarrassment. She is frivolous, artistic and very fickle in her desires. The main feature of the Aries-Monkey sign is unpredictability. This person can be anything: calm and daring, judicious and fussy. It all depends on the mood and the situation in which it turned out. But in his courage, determination can not be doubted. Whatever the circumstances, Aries-Monkeys are always in the thick of events: fear and doubt are unknown to him. People of this combination are simple and friendly in communication, and most importantly, they are able to maintain their positive attitude, despite any troubles. Monkeys-Aries are distinguished by cunning and dexterity, without a twinge of conscience manipulate the feelings of people. However, they can not hurt anyone, they are not inclined to betrayal. Aries-Monkeys are an amazing alliance, full opposites are peacefully coexisting here: narcissism and simplicity, purposefulness and superficiality. These people carry a holiday, joy. They are not only pleasant to communicate with, but you can count on their help. An important clarification: exactly until they have their own interests. In the ability to defend their rights, Monkeys-Aries have no equal: they always follow their own opinion. In love relationships, the Aries-Monkey remains true to itself: a sea of charm and endless energy. And actively caring for everyone who liked him. Can not live without strong emotions and vivid passions. Such a person is difficult not to notice: always on the positive, sparking with ideas. On a love horoscope, Aries-Monkey is a temperamental partner. Will pursue the object of his passion until he achieves reciprocity. But his affection does not mean anything at all: he is in the continuous search for his ideal. The family man of the Aries-Monkey sign pleases with its constancy: it is true to the partner. Once he really falls in love and start a family, how he changes his habits. But one thing remains unchanged: Aries-Monkey — leader. It is quick-tempered and stubborn, does not want and can not obey. His second half should show miracles of wisdom and patience: no jealousy and reproaches. In another way, it will not work peacefully with him. But Aries-Monkey works a lot for the welfare of his loved ones, supports them in everything. In terms of career Aries-Monkeys do not have to worry much: a successful future is guaranteed to him. Easily copes with the tasks of any complexity, is not afraid to take risks and move forward. He is passionate, confident in himself, readily accepts the challenges of fate. Men and women of Aries-Monkeys are born-again careerists: they dream of a high position. However, not all of them know how to stop in time to enjoy their success. Gradually lose interest in the matter and begin to dream of new achievements. Among the people of this combination, you can find representatives of various professions: philosophers, politicians, scientists, actors. Aries-Monkeys easily find a common language with children. They can become good teachers if they get patience. Restless and active Aries-Monkey can be successful in business: it has the talent of an entrepreneur. Has a business sense, flexible thinking, excellent communication skills. He quickly reaches a high financial position, which flatteres his vanity. 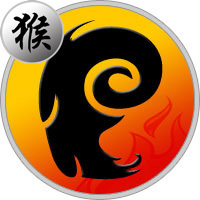 Active Aries-Monkeys men are striving to achieve success in all spheres of life. Ambitious, vain people constantly seek confirmation of their exclusivity. Enjoy the attention of society, the admiration of colleagues, care and love of loved ones inspire confidence in them. They try to get a prestigious profession and take a high position. They possess the gift of eloquence, they are able to convince, therefore they quite successfully organize their life. In love, they do not show constancy, but relations with them are fireworks of feelings, women can not resist the power of their charm. They will be happy in alliance with a partner who is ready to serve their interests faithfully. Effective women of Aries-Monkeys sign are a big mystery for men. They love to flirt and flirt, are able to chat for hours and have a passion for luxurious outfits. At the same time, they are clever enough and clever people, aimed at a successful career. Due to their resourcefulness and ability to communicate easily reach the intended. Of them can come out excellent assistant manager, managers, and educators. Are able to speak and convince anyone, easily charm the most impregnable man. True and official marriage would not be able to keep Aries-Monkey from novels on the side. A windy woman needs compliments and courting admirers. But this is a beautiful, caring mother, she is ready for anything for her children.